"This is a spicy dip that has become a staple for football watching in our house! 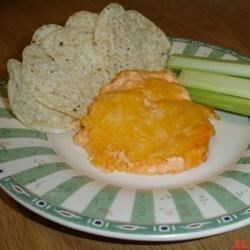 Chicken, cream cheese, ranch, cheddar, and hot sauce are combined to make this awesome dip! Serve with tortilla chips or crackers." Place the chicken breasts into a saucepan and fill with enough water to cover. Bring to a boil, then simmer over medium heat until chicken is tender enough to be pulled apart with a fork. Drain and cool until cool enough to touch. Shred or chop chicken and place in a 1 to 2 quart casserole. Mix the cream cheese into the chicken until well blended, then stir in the ranch dressing and hot sauce. Top with Cheddar cheese. Bake uncovered for 20 minutes in the preheated oven, until cheese is browned and the sauce is bubbly. I make this all the time and People Rave over it! It's so easy and good. I have, however, found that it doesnt warm up as well with the cheese on top. I have been making this for years, we call it Chicken Wing Dip, and everyone loves it. I usually use cooked canned chicken and then bake it, its less messy and much faster!